Shopping for Nightmare Before Christmas Paperweights? Celebrate Christmas and Halloween...any time of year! A stunning resin paperweight featuring Jack Skellington from The Nightmare Before Christmas. Fully painted and highly detailed! 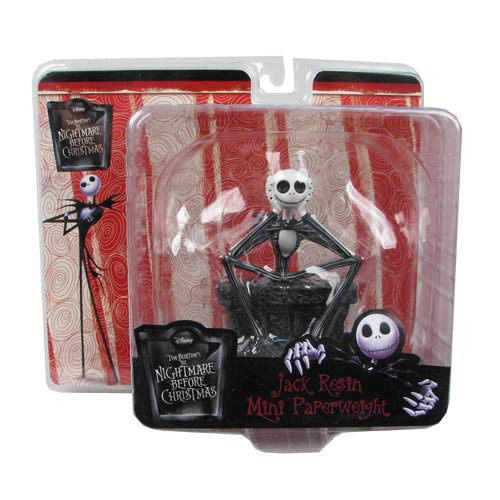 Nightmare Before Christmas Jack Skellington Resin Paperweight. Accessorize your office with great Nightmare Before Christmas Style! This highly detailed paperweight is sculpted from resin, and features Jack sitting atop a tombstone. Measures 4-inches tall x 6 1/2-inches wide x 4 1/2-inches long. Order yours today!